If you want to have a look at older Reports, please subscribe to my Mailing List. Thanks for visiting! This year’s race in Port Macquarie had pretty slow conditions, especially on the run. A low adjustment of -2:35 (mainly caused by a -1:16 run) leads to a new course rating of 4:15. After a few year’s of smaller fields (9 athletes in 2012 and 8 in 2013), this year had a larger field with 16 Pros. Paul Ambrose took the lead in the second half of the bike, building a lead of almost 7 minutes into T2. Luke Bell was working hard to close the gap and whittled it down to about a minute with 5k to go. Paul was then able to find another gear and won by just over two minutes while Luke Bell had to settle for second. Brian Fuller finished third, resulting in an all-Australian podium. Both Luke Bell (3.665) and Paul Ambrose (2.875) will some more Kona points for a safe July slot. However, Pete Jacobs validated his Automatic Qualifier slot with a 9th place finish in 9:38. He was in the lead until 120k on the bike, but said on Twitter after the race that he ran out of gas at that point. Lisa Marangon was leading the race into T2, but had to end her race early in the run. At that point, Jessica Fleming took the lead, but she was run down by Michelle Bremer who won the race with the fastest marathon. Jessica finished second, while Michelle Gailey took the third place in her come-back race. At this point, it seems unlikely that any of the female Pro athletes from IM Australia will be able to get a Kona slot. Interested in my Rating Reports? Thousands of people have downloaded my Kona Rating Reports and the Season Rating Reports. If you want to get access to older reports and to be notified when a new report is available, please subscribe to my Mailing List. Thanks for visiting! Thousands of people have downloaded my Kona Rating Reports and the Season Rating Reports. If you want to get access to older reports and to be notified when a new report is available, please leave your name and email! The content on TriRating will always be free, but your donation helps me to spend more of my time and energy on it and to provide helpful and interesting content. Thank you for your support! I look forward to your feedback. 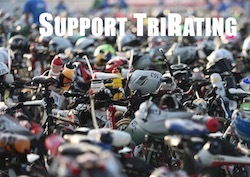 You can leave a comment or send me an email to thorsten@trirating.com. © 2019 TriRating. All Rights Reserved.